Power the clip-on LED lamp with either the USB cable or the included USB to AC adapter. Enjoy the freedom that it provides. Whether you use your laptop, computer or wall socket, enjoy all of the 5V/ 1A power given to you. The clip-on LED lamp utilizes 3 light settings to provide white light for you whether you are studying, reading, or needing some extra brightness. Use the soft touch power button on the clip to choose one of the 3 brightness levels to accommodate those different lighting environments. The non-flickering LED light is easier and safer on your eyes. Use the 24 LED’s light however long you need without the heat. 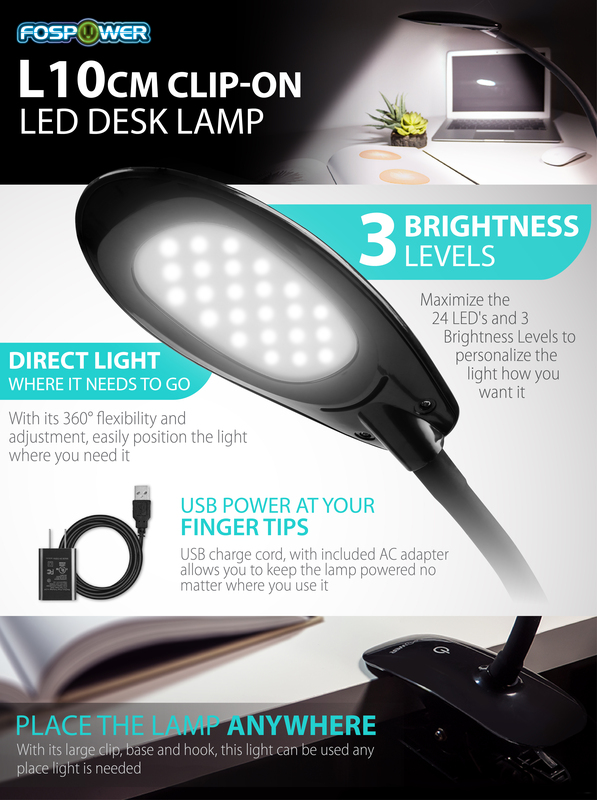 The clip-on LED desk lamp provides appropriate soft light without heating up your desk or reading area. The LED’s efficiently light up what you need them to, and remain cool to the touch. Designed to be free standing, clipped to the edge of a desk or book, or a hook on a wall, the clip-on LED desk lamp gives you every opportunity to have light where you want it. With its large plastic clip, easily clip this to music stands, pianos, bedside tables, work tables, mixing tables, computer desks, craft tables, and even your favorite book. If you want to use it free standing, have at it. The plastic clip with its broad size allows for the lamp to free stand when not clipped on. The black rubber covered, 13” metal goose neck on the clip-on LED lamp has the ability to swivel, roll up and move 360° allowing you to optimize your lighting conditions.